(file photo) Nevis Island Administration’s Cabinet Secretary Mr. Ashley Farrell. 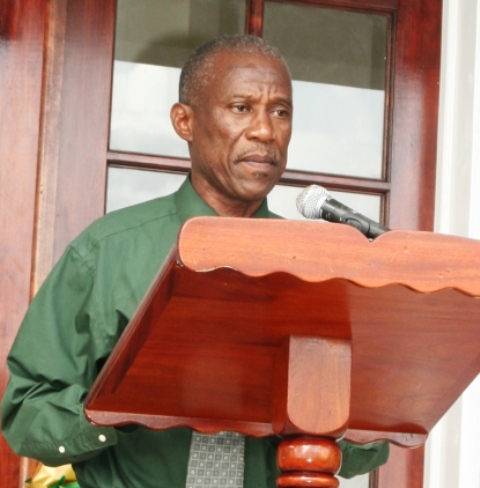 NIA-CHARLESTOWN, NEVIS (March 21ST, 2011) — “The NRP-government takes transparency, accountability and reporting to Nevisians very seriously,” said the Nevis Island Administration’s [NIA] Cabinet Secretary, Mr. Ashley Farrell, during a recent interview at his Bath Hotel office. Mr. Farrell was at the time explaining the details of a weekend-long trip to Anguilla and St. Maarten involving Premier of Nevis the Honourable Joseph Parry, Deputy Premier the Honourable Hensley Daniel and Attorney General the Honourable Patrice Nisbett. The government ministers, backed by a three-member support team, participated in a series of meetings that addressed the developmental projects in Nevis as well as the government’s immediate plans. “It’s an opportunity for the government to report to Nevisians living in these two islands and at the same time, hear from them because as you very well know, there are many stories that go to Nevisians abroad. This is the government’s opportunity to set the record straight,” he explained. Among the activities was a radio call-in programme on PJD2 where Premier Parry addressed the concerns of Nevisians residing on St. Maarten. “They [Nevisians in St. Maarten] will be able to understand what is happening in the country. This is an opportunity, not just to see the Premier via computer, but to actually be there to interact with the Deputy Premier as well as the Honourable Patrice Nisbett,” Mr. Farrell explained. While on St. Maarten, Premier Parry met with the Prime Minister and the island’s Minister of Justice. A similar meeting was held on Anguilla with the Chief Minister and his Minister of Energy.